A story on Reddit asks, "Did Palestinians Recognize Texas as Part of Mexico?" The origin of the story might be dubious, but it doesn't prevent the "fake news" story from accumulating 1.5 million likes across multiple platforms in just four days. The fake news dilemma dates back centuries, according to Politico, but the advance of technology and the rise of social media, it's now at its zenith. The problem of fake news fascinates Shivam Parikh, a doctoral student in UAlbany's College of Engineering and Applied Sciences. Parikh, working with Associate Professor of Computer Science Pradeep Atrey, recently presented on the subject at the IEEE 1st International Conference on Multimedia Information Processing and Retrieval. Their paper, "Media-Rich Fake News Detection: A Survey," looks at the challenges associated with detecting fake news, existing detection approaches that are heavily based on text-based analysis, and popular fake news data sets. But while the task to detect fake news may sound daunting, there are several promising methods at researchers' disposal. Parikh and Atrey present a categorization of these approaches, their key characteristics and then analyze their respective advantages and limitations. These methods include approaches that analyze linguistic features of stories to extract key patterns in fake news, or deception modeling, which is the process of clustering deceptive vs. truthful stories. 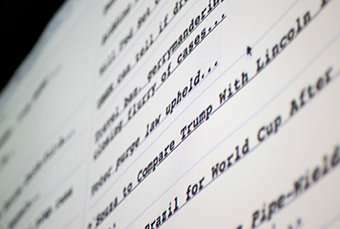 Other approaches include developing predictive models that can assign positive or negative coefficients which can increase or decrease the probability of a story's truth; or content cue analysis, which is based on the ideology of what journalists like to write for users and what users like to read. Fortunately, researchers have ample access to repositories of "fake news" articles in the form of publicly available data sets, such as BuzzFeedNews or LIAR. But while each of the data sets provides ample opportunity to study linguistic detection models, none possess a method for analyzing photos, for example. "Visual presentation plays a huge role in people believing in fake news content. This calls for verification of not just language, but images, audio, embedded content, such as embedded video, tweet, Facebook post and hyperlinks," said Parikh. Parikh also advocates for a detection method that can verify the source of the news story, and consider the trustworthiness or validity of the source once it's determined. An author credibility check can serve a similar function, where a system can be used to detect chains of fake news written by the same author or same group of authors.